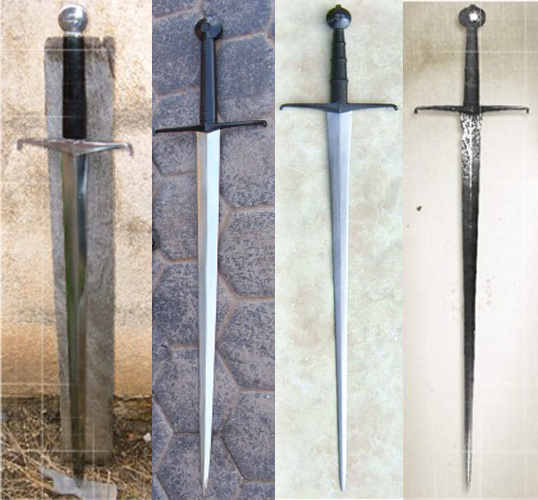 The Black Prince sword has been reproduced by almost every major medieval sword manufacturer. 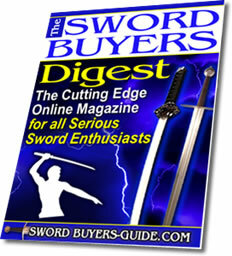 Most consider the Arms and Armor Black Prince sword to be the pinnacle of the production sword market - and you can read an excellent review of it here on My Armory. We also have a review of the Legacy Arms version on our site here but neither of these are technically 'beaters'. In this review, we take a look at Darksword Armories interpretation - not just from a historical point of view, but from the point of view that SBG does best - bashing it against things to find out what it can do and how much it can take!! I've always found the style of the Black Prince sword extremely appealing. The best relatively low cost replica (in terms of matching the look of the original) would have to be Legacy Arms replica in this review -but it's hard to get hold of and it's not a 'take on everything' beater like this one.. 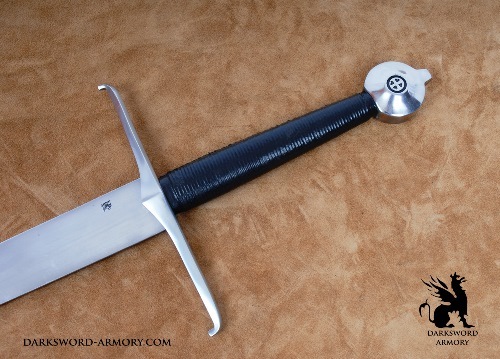 While most manufacturers settle on a vague "pointy blade, quillions abruptly curved down at the ends and a round pommel" - and slap on the Black Prince name, Darksword did it a little better..
And as I have always loved this style of sword, as soon as Eyal from Darksword showed me some pics of the prototypes, I knew I had to get my hands on it.. 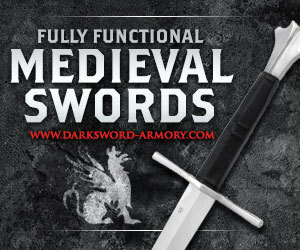 The Darksword Armory Black Prince sword is available in two versions - one with a regular scabbard and one with an upgraded scabbard with intricate sword belt for an additional $75 or so (depending on where you buy it from). As the most common complaints about Darksword pertain to their earlier model scabbards (which were poor fitting, blocky and certainly did not compliment the swords) I had to get the elite option, and I am glad I did! Consisting of a form fitting wooden core covered with black leather, the slimline scabbard on the upgraded option included an intricate belt and suspension system that wraps around the scabbard when not in use and is an incredibly dramatic contrast to the originals. 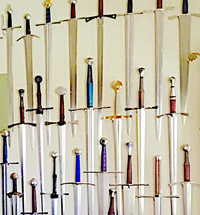 The upgraded scabbard makes it not only easy to wear, but also looks fantastic when on a wall display. Anyway, after getting over the contrast between the breathtaking new scabbards and the old ones, my eyes were drawn to the fittings. The first thing that struck me visually about the Black Prince Sword was of course, how black the fittings were (actually called 'Bluing' - even though it's black, but that is what it's called). 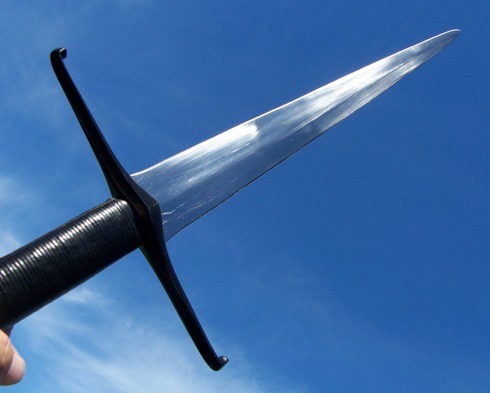 While the historical sword that it is based upon (which is now in a private collection) currently has blackened fittings, this was done in the 19th century - when in its prime the sword would have looked like normal steel. The most recent version of the Black Prince (2012 version) has done away with the 19th Century Blueing and returned the sword to how it would have looked when Prince Edward owned it. Personally, I think this is a huge improvement aesthetically. 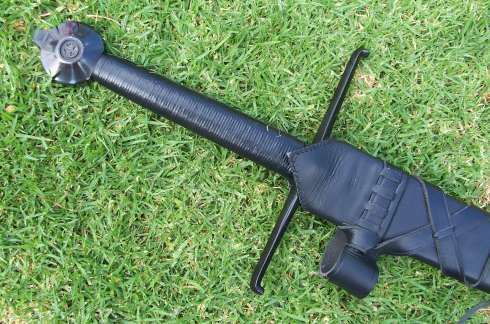 The crossguard is made from magnetic steel (not stainless), feels very sturdy, and is more or less an exact copy of the original sword. 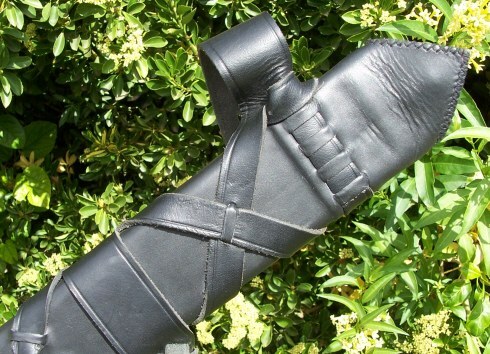 The handle has a wooden core, wrapped with cord and then covered with leather. The pommel is similar to the original, especially the small details, though it is not as 'fat' as the original, and the base prortudes a lot more on this replica (indeed, pommel smashes with this sword would be exceptionally painful!). There is a little bit of 'gunk' here and there in the inner circle of the pommel, but it cleans out easily enough with some metal polish. 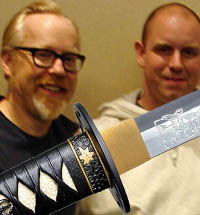 I do not believe that this sword is peened, though the pommel is on very tightly and I could not remove it. Either way, the whole assembly feels very solid and is decently put together, though not perfectly assymetrical, but not far off and gives it some character (careful study of the original sword, and many other medieval swords, reveals that minor misalignments were common, and the original seems to be seated a few mm to the right side of center). Overall though, the fittings are attractive, durable and nicely executed. 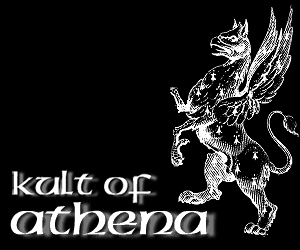 The blade of the historical Black Prince sword is an Oakeshott Type Xva (15a) a common 14th century blade optimized for the thrust. Designed to find gaps in plate armor and pierce through the maille underneath, it was certainly capable of inflicting very effective, debilitating cuts. Weighing in at 3lbs 13oz and with a point of balance just 3.5" from the crossguard, it is actually not all that far off the Arms and Armor version (weight 3lbs 11oz and POB 2"), which was based very closely on the original, and in the hands, feels quite agile and lively despite having a VERY stiff blade. My only real complaint is that the blade could be finished a little bit more smoothly. From most angles, it looks fine - but catch it in the right (or wrong) light and the finish is a little sctratchy. 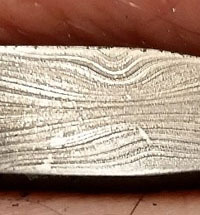 Like all Darksword Armory swords, it shows a few bumps here and there on the blades surface from the hammer forging, but personally I like this as it gives it some real character and is to be expected from a hand forged blade. Growing a little bored with the 'usual' targets of tatami mats and water filled bottles, the Black Prince sword joined a few other blades to meet and greet some very demanding targets on the 'battlefield' (ok, well - in the backyard, but use your imagination!).. And as you will shortly see, any maille clad warrior would be quite justified in being nervous facing off against this swords lethal point. Now I tested the Black Prince Sword on quite a variety of targets this time, and must admit, the blades raw thrusting power was extremely impressive. 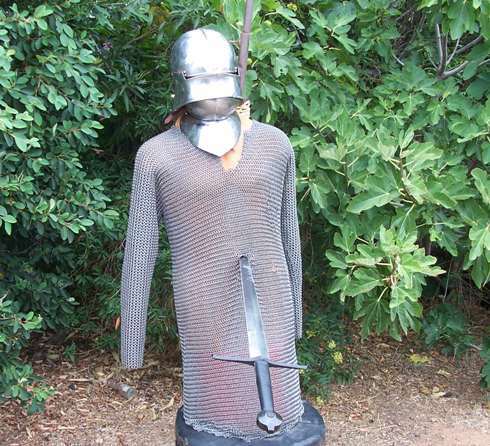 It penetrated maille armor without so much as breaking a sweat, burying itself deep into the torso of the test dummy. And even direct thrusts into the 14 gauge helmet did not blunt or damage the acutely sharpened tip (while other swords with a similar profile had their tips curled by even the maille!). Indeed, as you can see in the video, no matter what I threw at it - the blade itself was undamaged, but I cannot say the same thing for the targets! Flexing and tests on heavy targets including maille armor, steel helmets and a steel pole! The only weak point I could find with this sword was that some of the shockwaves from hitting the steel pole transferred into the hilt, loosening it slightly.. 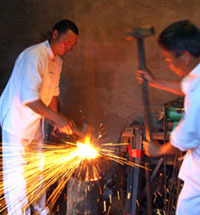 This is not that hard to fix, but as the Black Prince sword does not have the kind of assembly designed to be taken apart, but can be done using the technique for peened pommels shown here. Slightly annoying, but the blade itself held up extremely well - and considering what I subjected it to, if some slight loosening of the hilt is the worst of it I can hardly complain! 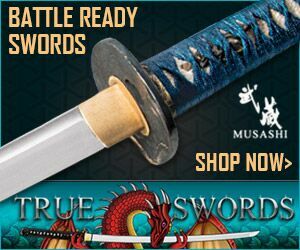 So how does the Darksword Black Prince sword stack up compared to other replicas of this famous sword? It certainly looks the part, it handles well, the blade is amazingly strong and durable, and the fittings perfectly adequete. It is capable of easily piercing through plate armor, and delivering powerful cuts. The only downside is that if you are crazy enough to abuse the blade to its full potential, the fittings are kind of hard to tighten again - but the sword still remains usable. 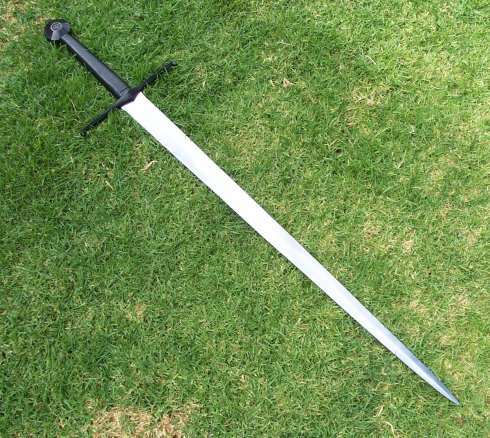 The only improvement I would recommend on this sword would be to peen the pommel or make it easy to disassemble for retightening: but even as is, this is still an amazingly good value for money replica. 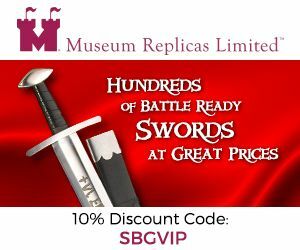 I have been so impressed by the Darksword Armory medieval swords that I have been stocking them at the SBG Sword Store since 2008 - and stand behind these great blades 100%. 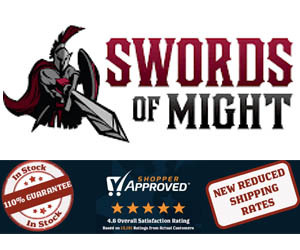 You can find the Black Prince Sword in our store here where we sell it at the manufacturer direct price of $330 (but offer FREE SHIPPING to the USA and Canada, plus our extended guarantee).